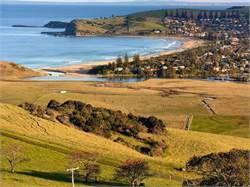 Kiama's local cedar forests attracted the first European settlers, but the harbour became the focal point of the town as Kiama developed. The local basalt quarry and dairy farms ensured the town’s prosperity throughout the 20th century. 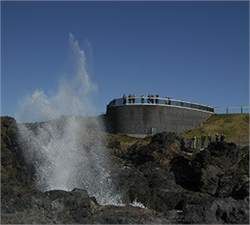 Kiama is famous for its Blowhole. On the cliffs at Blowhole Point, waves surging into an underground cavity are compressed and forced upwards, exploding high into the air and accompanied by a loud 'oomph'. The strength varies according to the wind, waves and tides, and when it’s pumping, it always draws a crowd. Situated on Blowhole Point adjacent to the Visitors Centre, the Pilot’s Cottage Museum tells the story of Kiama’s colourful past, from the time of the cedar cutters to the basalt quarrymen and dairy farmers.It also tells you about the region’s maritime history, including the fateful 'Bombo' tragedy in 1949, when the ship sank with the loss of all but two of her crew. Kiama Terrace, the row of weatherboard cottages along Collins Street, was constructed in 1886 to house quarry workers and their families. These are the country’s oldest weatherboard terraces, now restored as a row of cafés, bookshops and arts and crafts shops. ~ Visit the Saddleback Mountain lookout for spectacular 180-degree views of the coastline. ~Admire Christ Church and the ornate Italianate post office on Blowhole Point Road, both designed by the noted colonial architect, James Barnet. ~ Swim in the rock pools built on either side of the harbour in the 1880s. Kiama Agricultural Show, in January, brings the local agricultural community to town to showcase animals and produce. Kiama Jazz & Blues Festival, in March, has the whole town dancing in the street.